If you really want to get a Surftech board, then I suggest being patient and finding a good deal on one. If you want one of these guys brand new they usually cost in the $700+ range, but I have gotten two of them in the past 6 months, the Stretch F4 Bat-tail Quad and the Channel Islands Ksmall, each for less than $400 brand new. They seem to always be available from somewhere for close to 50% off. I ordered the Channel Islands Ksmall off of Whiskey Militia for $320 brand new. I wasn’t even looking for a new board, I just could not pass up the deal. I figured it was worth buying even if I just wanted to try it out then re-sell it. The sad thing about buying this board, was that I only had 3 weeks to try it out before leaving to Hawaii, and the waves were horrible the whole time (I didn’t take it with me because of baggage prices at the airport). So this will be a two-part review…the second part taking place whenever I get back to California and try out the board in better surf. 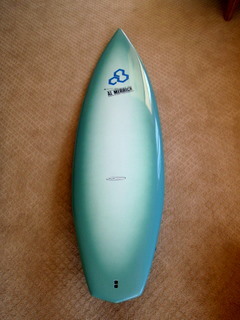 On the Channel Islands website, this board is described as Kelly’s favorite small wave board. I don’t think they were referring to waves as small as California had while I was testing this board out. The waves were so terrible that I think most boards wouldn’t have worked. When I stuck to riding wide, thick fishes and longboards, I was able to have a little bit of fun, but when riding the Ksmall I was just bouncing around trying to get into waves, never getting any speed. I can’t judge the board solely off this experience, because the waves weren’t there for me to really feel what it is capable of. There is one thing that I did notice that I loved about the board even in the crappy surf…it is nearly invincible. On several occasions when I got a little bit of speed I would try chop hop 180’s or throw everything I have into an air on a closeout. More than once I completely slammed the board with my body, for example, one air attempt ended in me dropping about 4 feet with all my weight landing knee first into the deck. I was so bummed thinking I had just put the biggest ding in the board, only to find it unscathed. No matter how hard I hit the board, it never got a single ding in those three weeks of testing. Things would have ended up much differently if I was riding a normal polyurethane board. So until I try it out another time, just know that Surftech boards really are some of the most durable boards out there, and check back in a few months to see how the Channel Islands Ksmall by Surftech performs in good surf.